Lighting-Gallery-net - high pressure sodium/Westinghouse medium base Ceramalux anyone ever seen one? Westinghouse medium base Ceramalux anyone ever seen one? Don't think anyone here on L-G has a pic of a true Westy med base Ceramalux. Ok, will replace this pic later tonight. Done. I drew the etch on the right of the lamp so people can see it. Nice! Though I'm bummed to see that Westy didn't use a BT shape medium base lamp lol. I imagined this in a BT-17 envelope, lol. EYE made medium based BT lamps though. Hey thanks! A clear one! Cool lamp, and the clear shows the construction. At first I thought Westy was using external-amalgam reservoir GE arc tubes, but now I see is is an external amalgam reservoir WESTY arc tube! Cool! Never knew they even MADE medium based HPS lamps! That's a typical American B-17 design, at least the earlier ones. Nice lamp, Dave! 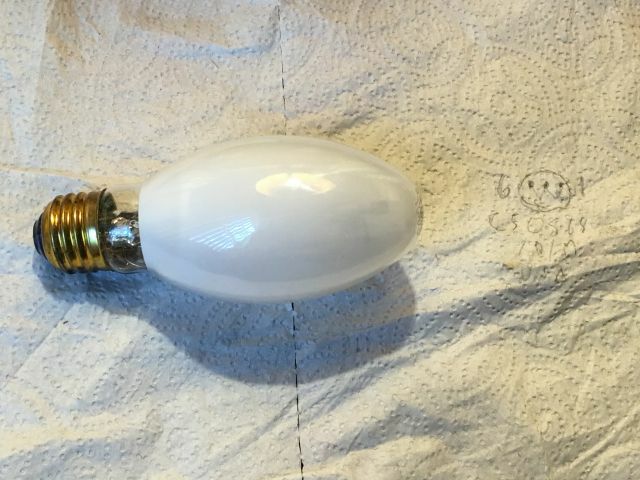 These medium-based Westinghouse HPS lamps are really not common out there, and 50 W is really low for a primitive burner construction having niobium end caps with an external amalgam reservoir.